The Cardinals had 5 of the first 44 picks in 1991 MLB Draft. The team chose California high schooler Dmitri Young with the 4th overall pick. The other four picks? Allen Watson is obviously one of them, the post is about him, but they also got Brian Barber and Dan Cholowsky. Young and Watson made it the Majors and played for awhile, Barber played a short time, and Cholowsky never made it past Triple A. Young, Watson, and Barber all have a significant number of cards, Young obviously has the most of the group. Cholowsky actually has baseball cards in Bowman, Stadium Club, and the Upper Deck Minors sets. 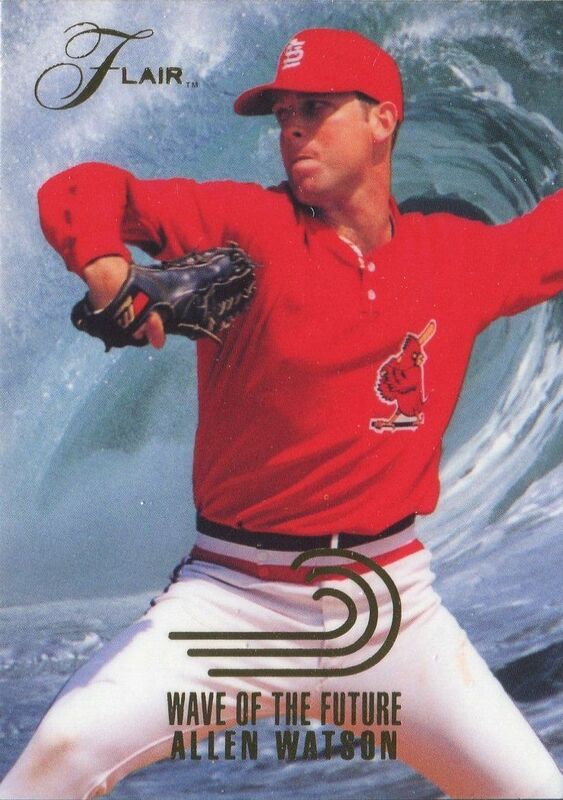 While he never made the Majors, some card companies still thought highly of him. Watson seemed like he was going to be someone for awhile. 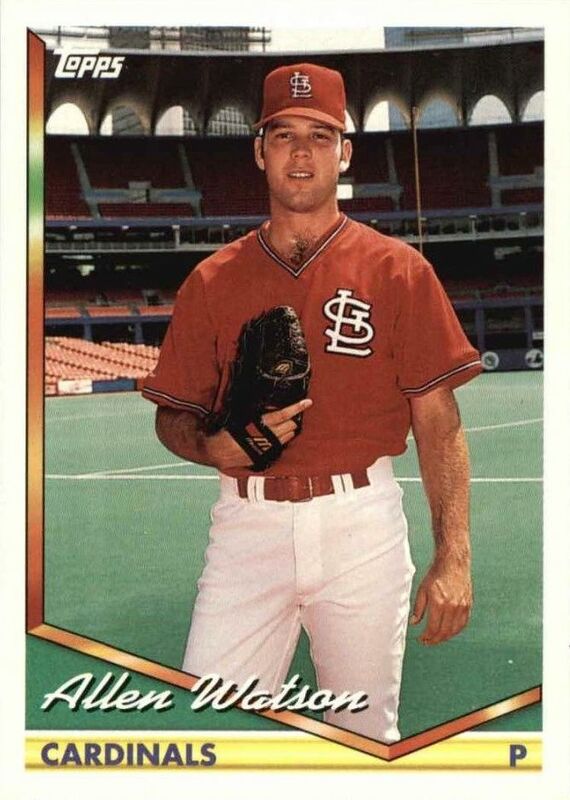 He cruised through the Cardinals Minor League system and reached Busch Stadium by July of 1993. He has a Stadium Club card to commemorate the occasion. I am actually fairly certain that I saw his Major League debut, which was a 7-1 victory over the Atlanta Braves. I need to double check my ticket stub box. It would have been cool if Topps had put an actual picture from the players debut game on the front of these cards. 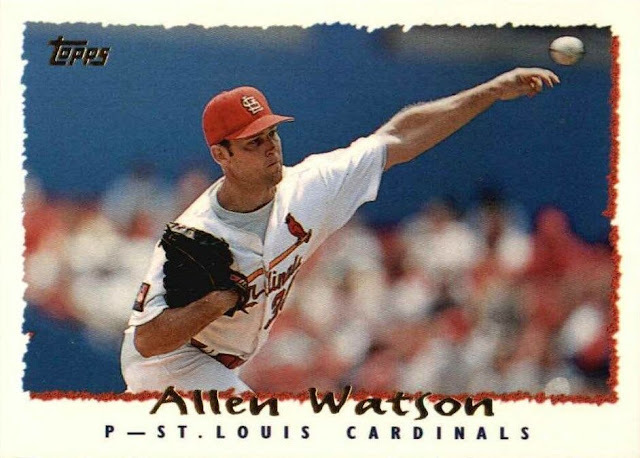 Watson debuted in St. Louis, card has a gray uniform, I am slightly disappointed. Watson was in Baseball America's Top 10 Prospects prior to the 1993 season, so it was a pretty big deal when he reach the Majors. The majority of his baseball cards treated him accordingly. I am not sure why Allen Watson is wearing half a road uniform and half a home uniform. Not something you see everyday on a baseball card. I also like that he is hitting. Sure, there is the occasional pitcher hitting card, but this looks like he is hitting balls for infield practice. Watson appeared in some of the more prominent 1990s sets. Good rookie cards in the 1993 SP set? Sure there is a Derek Jeter rookie card in that set, but there was also an Allen Watson. 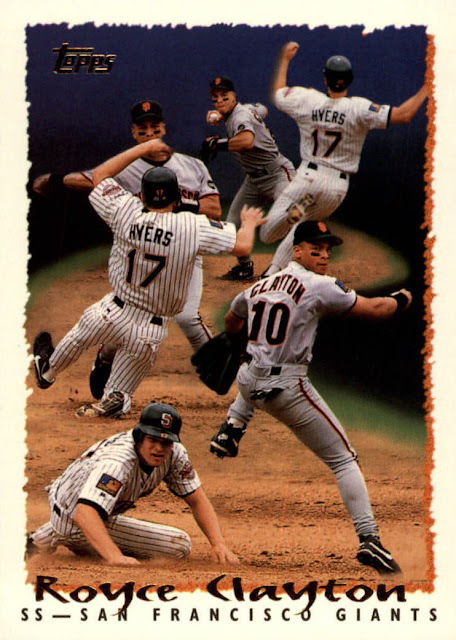 Good card back in the 1990s. Watson also appeared in many of the rookie/prospect insert sets. My personal favorite is the Flair Wave of the Future. These were printed on really nice stock and had nice printing and finish. That wave in the background is sort of cheesy in this set though. If this were a card in the 1998 Metal Universe set, it would be slam dunk best prospect card ever. 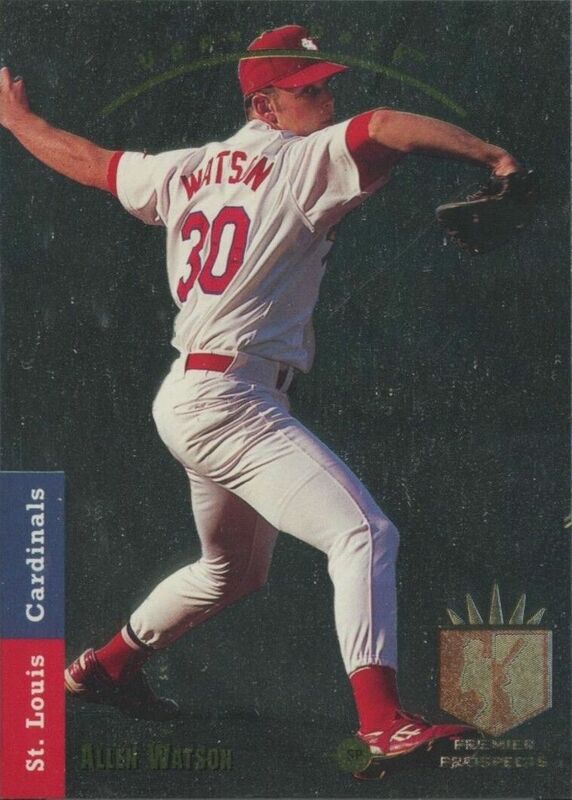 Watson had a decent 1993, but his star faded fast with the Cardinals. He got 22 starts with the team in 1994 and another 19 in 1995. His ERA was near 5 during both seasons. 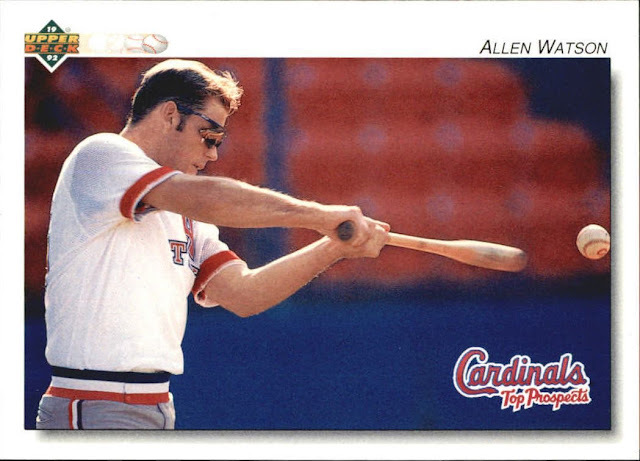 Allen Watson faded from trendy insert sets and shiny foiled prospect cards, and settled into the baseball card world as a player who got a token base card in the Topps and Upper Deck sets. I actually really like his base Topps cards from 1994 and 1995. 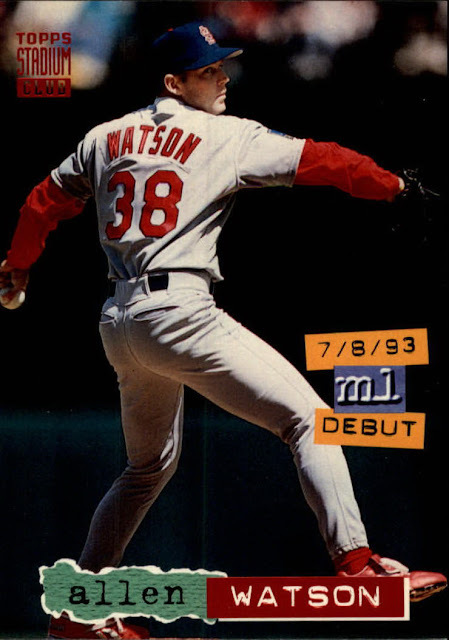 Not a huge fan of the 1994 set, but I like the Watson card. Love that background with the astroturfed Busch Stadium, blue walls, and faded red seats. The Cardinals freshened up the stadium in between 1995 and 1996, so this was near the end of this stadium configuration and appearance. 1995 did not have a great background, although the picture was clearly taken in Busch. I like this card more for the action shot. The ball in the picture has always looked a little funny to me. I know it's an action shot, so the ball was likely to turn out blurry, but this looks like Topps has tried to somehow crop the ball. At the end of the 1995 season, the Cardinals hired Tony LaRussa to manage the team and turned the roster over. One of the first moves the team made in remaking their roster was to trade Watson to the Giants for Royce Clayton. Clayton was also a former first round draft pick who had not lived up to expectations. When he arrived in St. Louis, Tony LaRussa made him the starting shortstop, putting Hall of Fame shortstop Ozzie Smith on the bench. Ozzie would retire at the end of the season. earning him a World Series ring. Watson was also on the 2000 Yankees, but only pitched until August before he was placed on the disabled list. He never played again in the Majors. That 1992 Upper Deck Watson has such a candid shot. Upper Deck did so many of those great shots in the early 1990's. Dude. That Royce Clayton card is flippin' awesome! How have I never seen it before?